New Delhi: The Union government’s plan to put as many as seven million electric vehicles on Indian roads by 2020 could require an investment of ₹ 22,500 crore, according to a report by the Society of Indian Automobile Manufacturers (Siam). The report has been drafted by Siam for the Union government and is part of a national mission plan for electric and hybrid vehicles that was proposed in the Union budget for the current fiscal. The objective is to cut dependence on fossil fuels. Mint has reviewed the study. The report suggests the government provide incentives such as building power infrastructure and electricity generation while original equipment manufacturers could partner with the government to develop battery charging infrastructure across the country to create demand for such vehicles. “An estimated ₹ 12,500-13,500 crore in investments would be required on the demand and supply side and ₹ 8,000-9,000 crore on research and development across all vehicle segments," according to the study. Demand for electric and hybrid vehicles in India is estimated to increase 50-fold by 2020, said a department of heavy industries official on condition of anonymity. “Our objective is to make consumers understand the benefits of owning an electric-run vehicle. Consumers in India are very cost-sensitive. So, to bring down the cost, we will have to heavily invest in the research and development (R&D) in the segment." The country will have to focus on improving battery technology, said an expert. “Most of the investments will go in the battery supply chain. 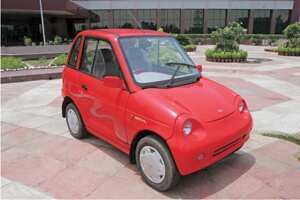 Motors are already available in the country," said Yash Saxena, a consultant at Emergent Ventures India. Japan-based Nissan Motor Co.’s electric car, Leaf, is the largest selling car in the world that runs on battery. It costs $33,000 in the US and its battery cost is at least half the car’s price. In India, the showroom price of electric two-wheelers ranges from ₹ 26,000 to ₹ 43,000, while electric cars made by Mahindra Reva Electric Vehicles Pvt. Ltd, India’s only maker of such vehicles, start at ₹ 3.5 lakh. Around 100,000 electric vehicles were sold in the country in 2009-10, according to the latest numbers available with the Society of Manufacturers of Electric Vehicles. Investments in manufacturing facilities would also be required from automobile makers, according to the Siam report. Four-wheeler makers would need to invest ₹ 41,000-45,000 crore over the next nine years, it said. As many as 4.8 million electric two-wheeler are expected to be sold by 2020, while four-wheeler sales could reach 1.3-1.6 million units in the same time, contributing to the bulk of sales of such vehicles, Siam estimates. Saxena of Emergent Ventures said the target looks “too ambitious" at this point in time. “If we could reach 10% of the total car market by 2020, that will be commendable," he said. “It could be more unless or until we see some revolutionary changes in the battery technology."